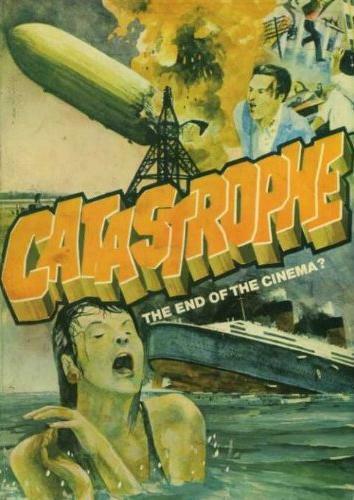 Never thinking I'd get to see it, I was fascinated by the images from J'accuse in the 1975 book Catastrophe: The End of Cinema (an illustrated guide to visions of the apocalypse that predated the 70's 'disaster movie' craze, and also anticipated the climax of Inglourious Basterds). I saw my first clip in David Gill and Kevin Brownlow's brilliant 1996 documentary The Other Hollywood (which looked at six European countries that once had film industries to rival America, before they were all put on hold by the two World Wars - enough time for Hollywood to dominate the market). Director Abel Gance rose to command the country's biggest budget for a silent film with the epic Napoleon (1927), pushing the medium to its technological limits. 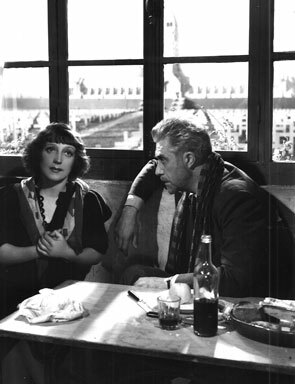 A James Cameron for silent cinema, Gance attempted to include a sequence shot in every film format yet devised, including his famous triptych of three side-by-side sequences, and even a 3D section (removed from the final cut). 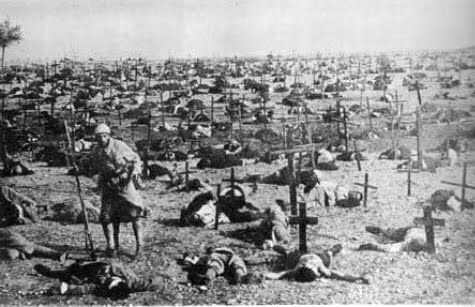 But Gance's two versions of J'accuse interest me more, for their early anti-war theme and horror-themed climaxes, where the war dead rise up and march on the living. A zombie fantasy to convey the real horrors of war. But the supernatural isn't the central premise to the films by any means. Gance is trying to convey many aspects of the impact of war through emotion rather than shock, through reality rather than fantasy. Such bold statements from a famous director, I thought these films would be easy to see. But the 1919 film has only just hit DVD (as a special edition restoration from Flicker Alley), and the 1938 remake was restored and last released on VHS in 1991 in the US. 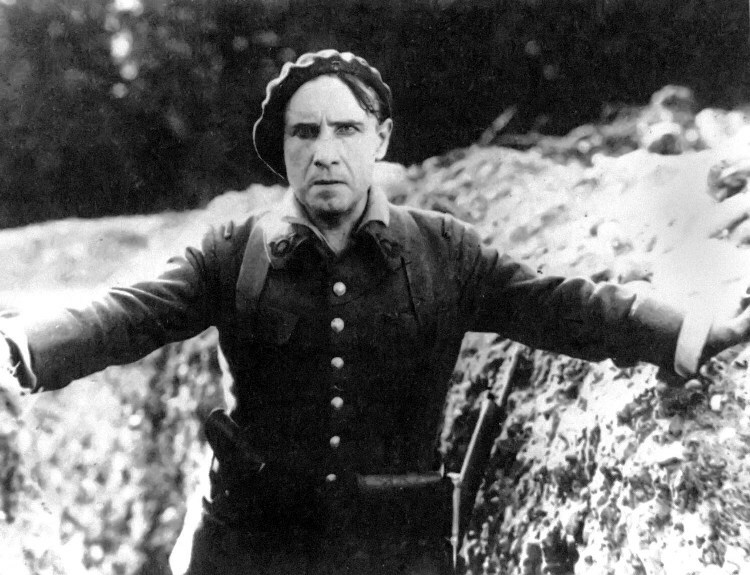 Such sparse access through the years has meant that films like All Quiet on the Western Front (1930, 1979) are better known for representing World War One. Abel Gance wrote and directed both versions, and even shot actual fighting during the end of the war. I'd love to know how on Earth he was allowed to borrow thousands of soldiers for the climactic marching scenes, during wartime, for an anti-war film! The splendid photography, lighting and rapid editing help the film look ahead of its time. The story starts in a small French village, where idealistic poet Jean Diaz (Romuald Joubé), and brutish huntsman Francois (the impressive Séverin-Mars) are both in love with the same woman. Their rivalry is interrupted when they enlist to defend France from the German invasion. I was then surprised by a little comedy as both rivals find themselves in the same regiment. 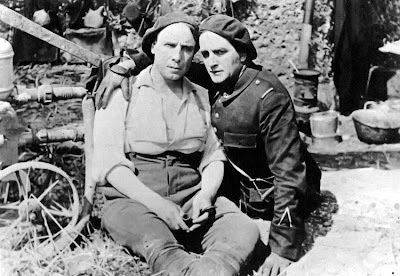 When their beloved Edith is captured by the advancing enemy, both men are driven to the edge of sanity amidst the bullets and missiles of the trenches of 'the western front'. The war-torn love triangle reminded me of Pearl Harbor (2001). Eventually Jean is discharged from the army with shell shock, leaving Francois tortured that Jean can now see his wife, who is actually hiding another more terrible secret from her husband. When the war finally ends, Jean dares the townspeople not to forget their dead relatives and friends. He tries to convince them that the dead soldiers will rise up and revisit them unless their consciences are clear. Is that really going to happen, or has he been driven mad? For the most part this is more melodrama than war film, but it benefits from being made at the time. There's realism in the emotional effects of war on the families and soldiers alike. Even small details ring horrifyingly true - the extended scenes of families saying farewell to sons, fathers and friends as they head for almost certain death, the soldiers' growing immunity to being around corpses, Francois thinking of his hunting dog as he lies in hospital... all well-observed and still uncliched. 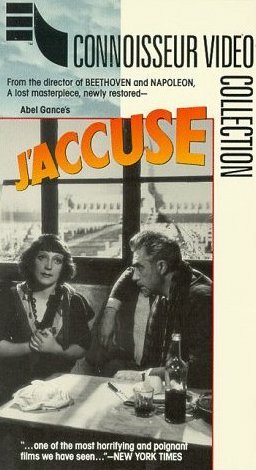 Gance demonstrates his skill in directing actors, using choice close-ups, symbolic superimpositions and even rapidfire editing, I found his overuse of the iris effect the only dated visual device. But this remains an accessible and sophisticated film for 1919, helped by a good score, authentic tinted scenes and a realistic projection speed. It's still very watchable, owing to the relatively natural performances. The new DVD presents an often scratchy, jumpy print, but one that gives us the original version of the story. Despite being 90 years old, many of the film elements still look good today, preserving the carefully lit cinematography. The montage that visualises Jean's poem to the Sun is particularly beautiful. The remake is a very different film, a far more emotional and direct plea, albeit a mysterious one. 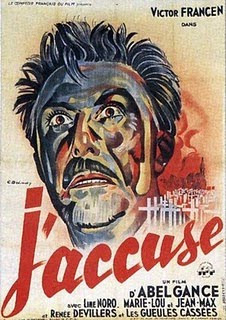 When he completed the 1919 film the war had just ended, but in 1938 Gance was desperate to prevent it happening again. It plunges straight into the war, eliminating practically the first two hours of his original story. The rest of the scenario is drastically altered and tightened. I only spotted a couple of shots recycled from the first film, and that was actual war footage. Jean and Francois are still rivalling for Edith's affections. But in an attempt to settle their differences, Francois makes Jean swear that if he dies, Jean won't hook up with his wife. Victor Francen (as Jean) is so intense when promising his friend, it's almost hypnotic, and frighteningly convincing. Throughout the story, Francen repeatedly and passionately laments the dead with enough tears and conviction for a dozen Oscars. I'm surprised that the only other film I've noticed him in was as the ailing concert pianist in the Hollywood horror The Beast With Five Fingers (1945). 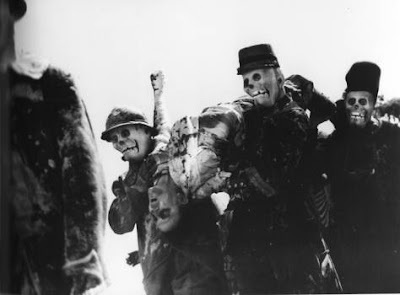 Gance is harsher, angrier, inter-cutting between the actual victory parade in Paris through the Arch De Triomphe, and shots of graves and corpses, all while upbeat marching music blares out. As the world gets back to normal after the war, Jean returns to live on the site of the battleground, near the graves of his comrades. His only friend, the cafe owner who kept the soldiers spirits high during the war. The centre section of the story then tries to rush through the love triangle plot of the first film, adding a second more unsettling triangle between his beloved Edith and her daughter (who confusingly look the same age)! The narrative then skips forward twenty years to the eve of World War Two, suddenly introducing that Jean works at a glass factory where new war technology is being prepared. I wish the core of the film was Jean's promise to his fallen comrades and his progressively more mysterious connection with their graveyard, as the scenes in his hometown appear to be far less relevant here. He appears to have been driven insane by his connection with the dead, rather than by shell shock in the first film. This is a much darker film, with many evocative passages pleading for sanity. The climax is far longer, more elaborate, a little confusing and pregnant with unused possibilities. The march of the war dead is realised both by stony (clay?) make-up and hundreds of actual war veterans who had been maimed and disfigured in the war, at a time when plastic surgery and prosthetic replacement were in still their infancy. I suppose it's not important how Jean calls the dead back - it appears to be by sheer force of will - but with a two-hour running time, a little more time spent on his methods would have been welcome. For such a monumental build-up, the final pay-off is powerful, but relatively short and ultimately too simple. Obviously, the dead want the living to remember their sacrifice, nothing more. I'd like a sequel to see what the dead did next! With all the rage and sacrifice, I'd have expected more anger and choicer targets. In a similar vein, Joe Dante's Masters of Horror episode 'Homecoming' (2005) brilliantly brought all the dead soldiers back to life... to vote! Again Gance uses real war footage, but by 1938 film projection speeds had changed, resulting in a marked difference in quality and far too 'sped up'. His use of cross-cutting is more jarring as a result. 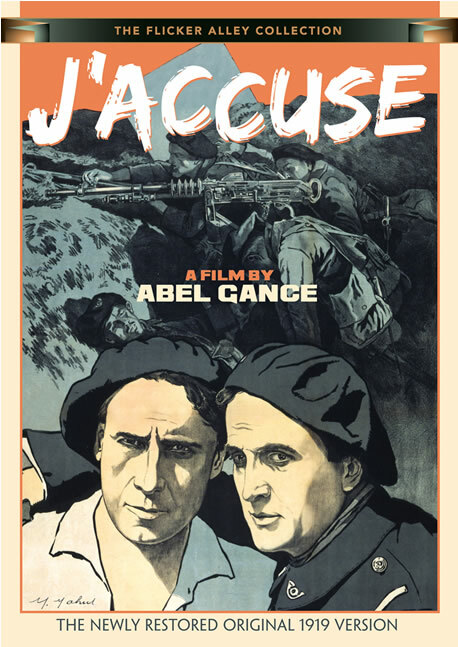 But I'd have thought this version of J'accuse was one to deserve a special edition DVD. The only copy I could find was this 20 year old VHS from Connoisseur Video. 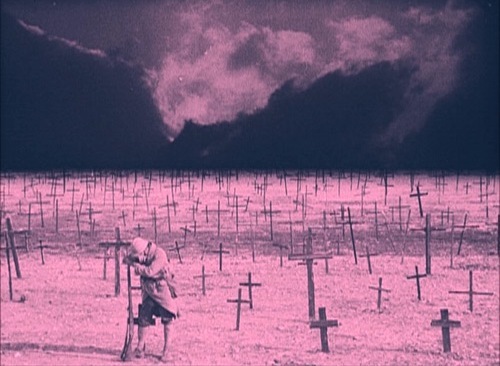 I'd also recommend The Great War (1964) as a first hand guide to the First World War. Using only documentary and newsreel footage, as well as eyewitness testimonials from both sides, this BBC series exhaustively described the harrowing history of 'the war to end all wars'. It was recently released on DVD in the UK. The World At War (1973) is an epic documentary series about the Second World War, and has just been restored and released on Blu-Ray. It's a harrowing and thorough history lesson, that I'd be reluctant to see again in any greater visual detail. Some of it is so gruesome and tragic. I found Catastrophe: The End of Cinema at a sci-fi convention ages ago, it's been my disaster movie bible for a while now.